The difficult sophomore record syndrome, a moniker that is often heard when a band releases its second album. Especially if the first one meant a breakthrough and led to more than just a little success. Mister & Mississippi did break with its debut and followed in the slipstream of the folkrock bands that (had) made it in 2013. Here's what we thought of the album (http://wonomagazine.blogspot.nl/2013/03/mister-and-mississippi-mister-and.html). We only part to meet again lies close to the debut. Nothing Mister & Mississippi produces on this album gives me the impression for even one second that the band had a lot of difficulty writing a new record. The folkrock element was kicked out totally. A lot is atmosphere now. A difficult segment for a band, especially live, as this music is tasking for the attention span of the average modern listener and especially the average concertgoer. There's a hint of Coldplay in the guitar sound, the long notes, the lack of chords, the high sound. Jonny Buckland is always close here. Like with the first album I did not get the second album in one go. I'll even admit to being a little disappointed. It wasn't until I gave We only part to meet the dedicated time it deserves, that the quarter dropped. Languorous sounds enveloped my ears and drifted me straight into the heart of the album. This is an album that demands time and attention to make an impression. Put it on in the background and it's over without noticing it was ever put on. Allow yourself to listen and all sorts of riches come forward that make clear that this is not an ordinary album. Another difference is that Mister & Mississippi put singer Maxime Berlag just this little more upfront. The lady with hat has become the lead singer in most songs. Not that this is a bad choice persé, but I truly like the voice of Samgar Lemuel Jacobs and even more the interaction between the two singers. Luckily we have the more uptempo 'The filthy youth' for that. The song that comes closest to folkrock this time around. With some horns and a loud ending for extra drama. 'Shape shifter' also cooks up a storm near the end, making sure that the listener remains awake, if necessary that is. 'The filthy youth' is an exception though. By far the most songs are in a slow tempo. Not unlike Low, but a bit more melancholicly optimistic. Like sitting in a cool, dark, Gothic church with the colours of the tainted glass windows falling all over the floor, so that you know the sun is shining outside of the thick, Medieval walls. That is the impression the music on We only part to meet again makes on me. Beautiful, but distant, cool with warmth within reach. It all ends with the smallest song, aptly titled 'A song for the quiet ones'. If anything Mister & Mississippi made the right jump forward. 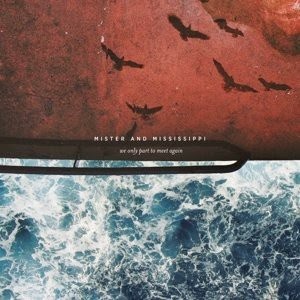 In our review of 'Mister & Mississippi' we concluded that a band full of talent presented itself. We only part to meet again proves us right. This album shows growth in several ways. This band could be here to stay.